Summary: Based on a horrifying true story of one of the Holocaust’s worst Nazi war criminals comes a crime thriller that combines a police procedural, courtroom thriller, and a fast-paced war-time narrative. In Ostland David Thomas confronts the question of how does one man charged with eradicating evil become one of its greatest perpetrator. In wartime Berlin the brilliant, idealistic young detective Georg Heuser joins the Murder Squad in the midst of the biggest manhunt the city has ever seen. A serial killer is slaughtering women on S-Bahn trains and leaving their battered bodies by the tracks. Heuser must confront evil eye-to-eye as he helps track down the murderer. Soon after, Heuser is promoted by the SS and sent off to oversee the systematic murder of thousands of Jews in the new empire the Nazis call Ostland. Years after the end of the war Heuser thinks his diabolical past has been forgotten. Yet, an enterprising young lawyer, Paula Siebert, searching through Soviet archives, discovers Heuser and his fellow officers’ crimes. 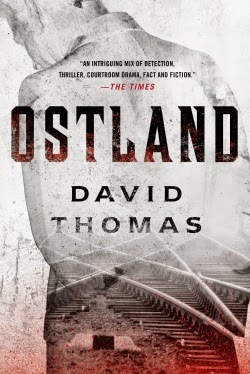 OSTLAND by David Thomas is a thought-provoking crime-fiction novel based on the true story of Georg Heuser, a young, upstanding Berlin detective who helped solve one of the most infamous serial-killer cases in Berlin and who, as a Nazi SS officer in WWII, was responsible for the deaths of tens of thousands of innocent victims. In the first section of the book, Heuser and his colleagues hunt down a man who rapes and kills women along the S-Bahn train routes in 1941 wartime Berlin. Because of his efforts, a great evil was eliminated from Berlin society and Hauser is recognized as a hero throughout the community. The author makes a point that Hauser was so morally correct that he even questioned whether he should drink confiscated real coffee at a time when most Germans couldn’t get real coffee. The author then moves on to Hauser’s time as an SS officer in Minsk, Russia, an area the Germans referred to as Ostland, where he systematically killed tens of thousands of innocent Jews. Where Hauser was so morally upright as a detective, he was now willing to take his “share” of the gold, jewelry and clothing confiscated from the Jews. Surprisingly, after the war Hauser worked as a respected West German policeman. The story, from Hauser’s hiring as a detective in 1941 until the Russian recapture of Minsk in 1944, is effectively presented in a first person narrative by Georg Heuser. Heuser constantly weighs the good he did as a detective against his actions as an SS officer in Ostland. Soon the S-Bahn murders pale in comparison to the Nazi slaughter in Ostland. Heuser realizes he is caught up in a system that is more insane than the killer he pursued in Berlin but he shrouds his behavior in the excuse that he was trained to always obey orders. Hauser’s narrative is interspersed by a subplot about a late 1950s-early 1960s German investigation and trial concerning the brutal liquidation of the Russian, German and eastern European Jews. Georg Hauser and his war crimes were front and center in these chapters as investigators were baffled by his change from hero detective to mass executioner to respected policeman. The trial results are almost ironic. OSTLAND is a well written novel combining historic facts and characters with fiction in a real thriller which asks the question “What is it about war that causes good men to turn into monsters?” However, the novel is not a comfortable read as the author describes in significant detail the brutal precision and breath of the Nazi liquidation plan for the Jews. The descriptions of Hauser’s actions are chilling and describe a person who had become almost inhuman in his behavior. The novel is both horrifying and intriguing at the same time. Thanks to Booking Pap Pap for his great review and to the publisher for providing a review copy of this novel. Hopefully Booking Pap Pap will share the book with you! This sounds like a page turner but I can see why it's not a comfortable read.